Sajad Lone and Akbar Lone. Amid hundreds of soldiers, their fast-moving vehicles, big garrisons, and sadbhavna banners that dominate the roads and landscape in north Kashmir, one can blink-and-miss small election posters of National Conference (NC) and Peoples Conference (PC) – two key local political parties contesting for Baramulla Lok Sabha. These posters are hung on electric poles, located mostly near army garrisons in peripheral towns; the areas expected to see a good turnout of voters this time. But apart from these posters, one can hardly get the feel of elections in most parts of Baramulla constituency, which has nearly 12 lakh electors. Most of the political activity is confined to small rallies in “friendly pockets” like Pattan, Tangmarg, Boniyar, Uri, Rafiabad, Handwara, Kupwara, and Lolab. These rallies are conducted in a low-key manner across the constituency. An element of fear among candidates and indifference among voters can be felt almost everywhere. However, as one travels deeper into the constituency, away from Baramulla and Sopore towns, that have historically stayed away from elections, both posters and men behind them become slightly visible. Spread over 15 assembly constituencies in Baramulla, Bandipora and Kupwara districts, there are nine candidates in the fray including Mohammad Akbar Lone of NC, Raja Ajaz Ali of PC, Haji Farooq Ahmad Mir of INC, Mohammad Maqbool War of BJP, Jahangir Khan of NPP, Abdul Qayoom Wani of PDP. But as one travels in the constituency the contest narrows down to between NC and PC. 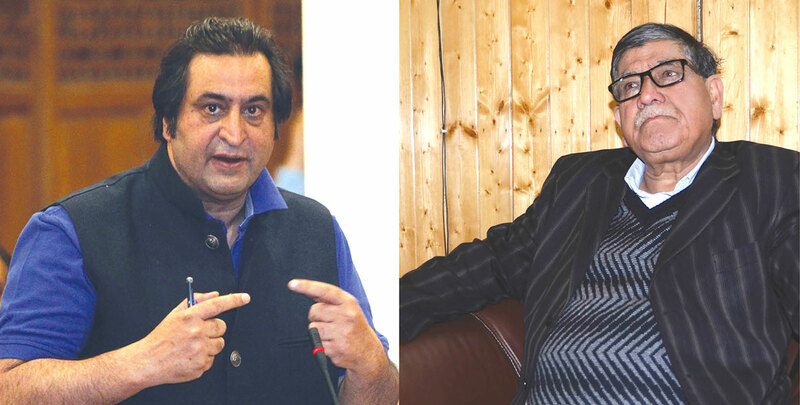 While NC has a loyal voter base, it is Sajad Lone’s PC that has emerged as a challenger with a strong base in Rafiabad, Handwara, Kupwara, and parts of Uri. Months before Lok Sabah elections were announced, Sajad has been doing his calculations, and allying with people whom he believed will help him get votes. Perhaps that is why he chose former PDP man Raja Ajaz Ali, who was the second runner up from Uri in 2014 assembly elections. But Ali’s influence among Paharis, a community, Sajad Lone had failed to lure previously, is surely going to help PC. But to write Sajad off is dangerous for NC’s existence in future assembly elections. Between 2014 assembly elections and 2019 Lok Sabah elections, a lot has changed on the ground, especially in north Kashmir. New alliances came up over the ruins of older ones. Sajad has been successful in stitching almost invisible alliance at a micro level with people who are the real movers and shakers in the elections. This includes independent Panches and Sarpanches with not more than a few hundred votes in their kitties. But when these few hundred are added up, it makes a huge difference in the final outcome. These alliances are stitched on small promises like the black topping of link roads, allotment of new electricity transformers, transfers, and tapped water. Unlike NC that promises the solution of Kashmir issue to its voters, PC is addressing local issues that concern people’s day-to-day lives. 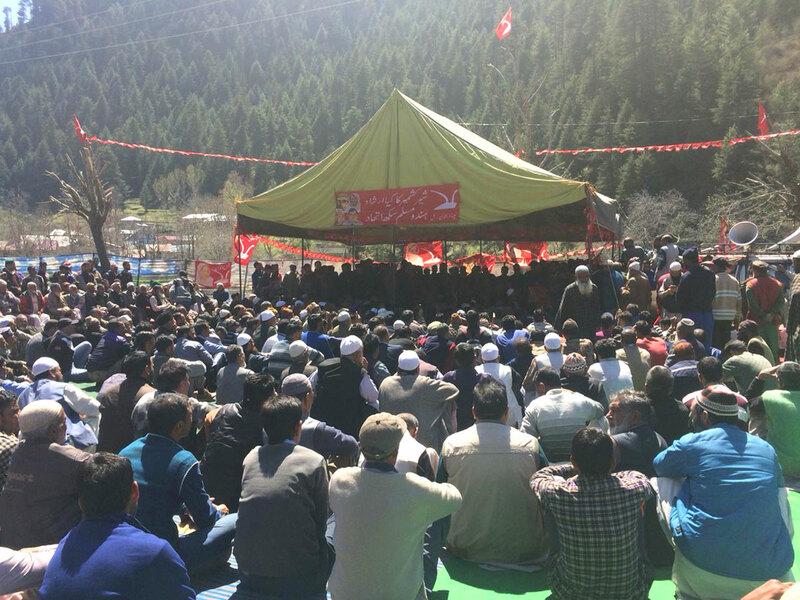 Around 500 people, mostly NC’s cadre, are huddled around a small make-shift tent pitched on the banks of gushing Uri nallah, with picturesque pine trees in the background. It is Akbar Lone’s first rally in Boniyar town. He is accompanied by NC’s famous face from the region Mohammad Shafi, a five times MLA since 1975. Five minutes into the speech Lone is explaining to people why Mohammad Shafi is called Shafi Uri. For Lone, safeguarding Kashmir’s special status is the key issue that they believe will help them win the elections. “It was PDP who let BJP into Kashmir and now see how BJP is behaving. Our aim is to keep BJP and its proxies out,” insists Lone. Election rally of National Conference in Uri. But even in the small township of Boniyar, which has a history of voting in large numbers, people don’t see elections as a mandate to solve Kashmir issue. Rather they want the contestants to focus on deliverable small day-to-day issues. “We all know none among them has the capacity to solve Kashmir issue. So why to lie,” said Mohammad Ramzan, 56, a local businessman. A day after Lone’s rally in Boniyar, party’s vice-president Omar Abdullah addressed a modest gathering at Pattan and raised the demand for a separate Prime Minister for Kashmir. He told the gathering that the demand is justified and constitutional. Omar also told people that Kashmir faces the onslaught from BJP, RSS, and allies, which NC will stop. “We know these are just election gimmicks. Be it Omar or anyone else, they cannot undo what has been done. They don’t have the capacity or will to do what they are promising people,” said Shareef-u-din, 65, a resident of Baramulla. Within half-an-hour, as the word spreads about Sajad’s presence in the house, people in smaller groups start arriving. It instantly fills all the rooms in the house. In a corner, Sajad sits wrapped in a blanket, listening to his party’s workers. They are planning a rally in Kupwara. For Sajad, who represented Handwara constituency in last legislative assembly and was made a minister under BJP’s quota, winning Baramulla seat will define PC’s worth in upcoming assembly elections. But can Sajad dismantle NC’s strong base in the region? But interestingly PC’s future heavily relies on former PDP politicians like Mohammad Abbas Wani, a former PDP lawmaker from Gulmarg, Imran Ansari, and Raja Ajaz Ali, for its success in Baramulla. “We have finished PDP, now we will finish NC soon,” said Sajad with a smile referring to lawmakers from PDP joining him. On the other hand former president of Jammu and Kashmir Teachers Forum (JKTF), Abdul Qayoom Wani, who recently joined PDP banks heavily on his image as an activist. But given the anger against PDP, even in remotest parts of north Kashmir, Wani has an uphill task at hand to salvage his and his party’s image. “Voting for PDP is out of the question. We would prefer BJP over them,” said Sheraz Ahmad, a first-time voter from Tangmarg area. Election campaign posters in Uri market. In order to connect with the voters, Mehbooba Mufti during a public rally in Baramulla used recent Balakot incident to take a dig at PM Modi. “19 trees and a crow were destroyed in that strike only,” she told a cheering crowd. But both Mehbooba and Wani know that their chips are down right now. It will take a lot more than rhetoric to lure voters into PDP’s fold. But while Sajad lost Bajad to NC, he got senior PDP leader and former MLA Mohammad Sultan Panditpuri’s son Irfan Panditpuri, PDP’s Raja Ajaz Ali and Mohammad Abbas Wani into the party folds. “All of them will add to PC’s strength,” said Sajad. 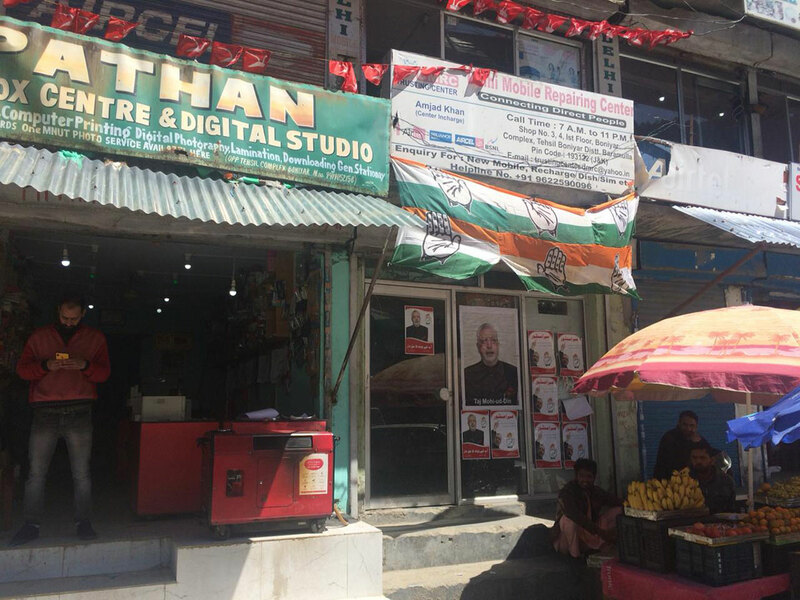 Perhaps that is why small party offices of NC and Congress are located in the same building in Boniyar’s small market place. For NC, the work of former MLA Mohammad Shafi aka Shafi Uri will decide Akbar Lone’s fate in the region. “Congress is banking on Taj Mohiddin’s image to secure those votes,” said Abdul Razaq Wani, a resident of Uri. “But Taj is the least visible politicians since he lost elections in 2014. Same way, Mohammad Abbas Wani represented Gulmarg as PDP’s candidate by securing 22000 votes. Likewise, Abdul Gani Vakil of Congress, who joined PC, was runner-up from Rafiabad assembly constituency. He secured over 15000 votes. His presence will help PC to cement its posting in the area, which traditionally belongs to NC. Before the filing of nominations for Baramulla, NC and Congress were in talks for a possible seat sharing alliance. Though the alliance did happen no consensus was reached on Baramulla and Anantnag seats. It was declared that both NC and Congress will have ‘friendly contest’ on these two seats. But NC’s Lone has an entirely different take when it comes to understanding with Congress. “They (Congress) are more dangerous than BJP. There is nothing called a friendly contest. Our fight is with Congress as much as with BJP and its proxies in Kashmir,” said Lone on the sidelines of a rally in Boniyar. But Congress’s choice of candidate clearly reflects their eagerness to have a friendly contest with NC. They chose Haji Farooq Ahmad Mir, who secured just over 7000 votes from Lolab in last assembly elections. The winner, PDP’s Abdul Haq Khan got around 30000.